In general, the disease is of minor importance on sorghum. 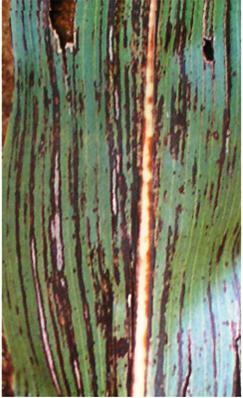 Bacterial leaf stripe is considered to be a low to intermediate priority disease of sorghum in eastern Africa. Initial symptoms are small (1 cm long), linear, intervenal lesions. Lesions on leaves and sheaths are purple, red, yellow or tan, depending on the host reaction. Under favorable conditions, lesions may exceed 20 cm in length and they usually coalesce along the width of the leaf. Water soaking of tissue adjacent to a lesion is usually not observed under field conditions. Bacterial exudates is usually observed from infected portions of the leaf under microscopic observation. Lesions may also occur on the kernel, peduncle, and rachis, and also in the pith of the stalk. Sorghum halepense (aleppo grass), Sorghum bicolor (sorghum), Sorghum sudanense (Sudan grass), Trifolium repens (white clover), Vicia sativa (common vetch). Bougainvillea sp, Ceratonia siliqua (locust bean), Cicer arietinum (chickpea), Dianthus caryophyllus (carnation), Gypsophila paniculata (babysbreath), Limonium sinuatum (sea pink), Trifolium pratense (purple clover), Trifolium subterraneum (subterranean clover), Tulipa (tulip), Vaccinium (blueberries) and Zea mays (maize). The bacterial cells are gram-negative rods, slightly curved with rounded ends, usually motile due to single flagellum per each cell. The colonies of these bacteria are mostly smooth on the medium. 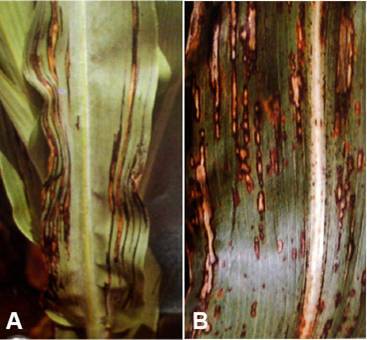 Plant debris is considered to be the primary over wintering source of B. andropogonis for bacterial stripe infection of sorghum (Tarr 1962). Tarr SAJ. 1962. Diseases of Sorghum, Sudan Grass and Broom Corn. The Commonwealth Mycological Institute, Kew, Surrey, 298 pp. Xanthomonas vasicola pv. holcicola Elliott. First symptoms are narrow, water-soaked, transparent leaf streaks, 2-3 mm wide by 2-15 mm long, appearing as early as the second leaf stage of the seedling. Lesions soon turn red, become opaque, and at intervals may broaden into somewhat irregularly shaped oval spots with tan centers and narrow red margins. In severe attacks, these coalesce to form long irregular streaks and blotches extending across all or much of the leaf blade, with dead tissue bordered by narrow, dark margins between the reddish-brown streaks. Abundant bacterial exudates is produced as light-yellow droplets, which dry to thin white or cream scales (Williams et al. 1978). Soil borne and infected plant debris transmitted the bacteria. No evidence of seed borne bacteria for transmission. Williams RJ, Frederiksen RA and Girard JC. 1978. Sorghum and Pearl Millet Disease Identification Handbook. Information Bulletin No. 2. ICRISAT, Patancheru 502 324, AP, India. 88pp.